Does one need special tools to assemble a Rolling Planter? Unlike other planters on the market, our planters are completely designed, made and shipped from our workshop in Ventura, California. When we started to develop our planters, we were so disgusted by planters found at the local nurseries and lumber marts. The labels, signage and information online stated they were easy to assemble, were supposed to be made of 100% one wood source, didn't require any special tools, had all the materials enclosed, etc. After purchasing and bringing home many of these planters, the horrors just begin. We found parts missing, we needed to purchase a special screw driver /tools, the wood was warped and could not fit properly or could not go together without some sort of modification. Worst, the companies stated their planters could be assemble in less than an hour, a half hour, and many in minutes. Simply put, our boxes take over 4 hours to assemble after all the parts have been seasoned and cut. All of our boxes are firmly bolted and fastened together with case hardened epoxy / glass coated steel fasteners ( not pegs, rods, staple nails or flimsy gimmick that compromise the integrity of the structure). We are sure many could put our planters together if they were in a kit form, but why? You are paying us for a finished product not one that you have to pay some else to complete. Why does the RollingPlanter have a liner? 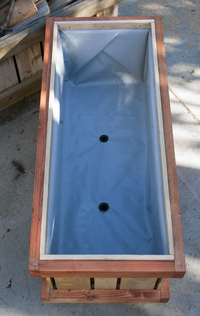 There two fundamental reason why the RollingPlanter has a liner: One water conservation and two, longevity. 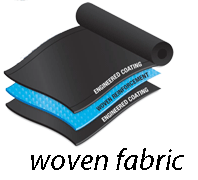 Conservation, by sealing the Rolling Planter with the three layer woven fabric liner, water is not allowed to seep or evaporate out of the sides or bottom. With reduction of surface area to evaporation and seepage loss the Rolling Planters conserve water. To incur greater a greater reduction of evaporation loss, one should mulch the topside of the soil surface after the plants have grown to 6 to 8 inches tall. Two to three inches of mulch helps reflect the sun, and hinders surface evaporation. Longevity, the liner seals the wood from constant water, fungus, and insect contact. By limiting the wood's contact to these elements, the wood does not rot, is not able to consumed by ground boring insects, or subject to damaging fungus and bacteria, etc. 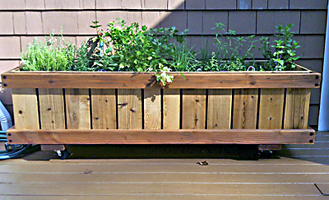 Many of our planters use ccedar planks for the planter's structural side panels. Cedar is renown to have a high concentration of tannin. Rolling Planter also come in Douglas Fir planked side boxes. Douglas fir has tannens its wood more so than new growth redwood. Douglas fir is stonger and the planks are twice as thick as the cedar. Tannins preserve and resist insects; also it impedes rot. However. in time and depending on weather and other natural circumstances the tannins are released and the the wood becomes vulnerable to the elements it was prior resistant to. New growth lumber, is more vulnerable. In months, a couple of years wood can rot away. With the liner we buy and insure time. We actually buy the length of the time the liner last, plus. Currently the liners we have in our first boxes have shown no signs of deterioration These boxes are over 16 years old and the wood looks great. There is no rot, no fungus, no insect damage. Still 100% functional!!! 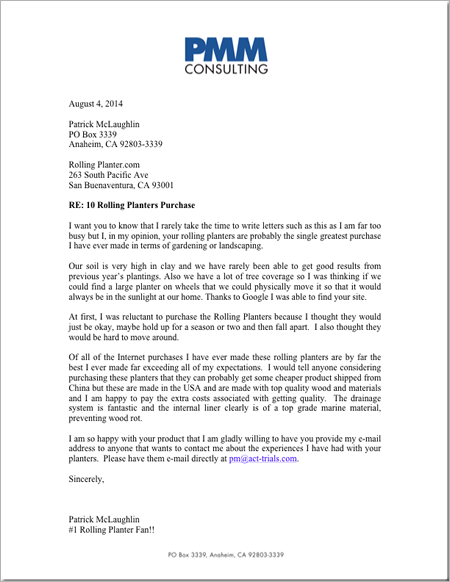 Why don't other planter manufacturers provide liners? Some companies do. If they do, they provide PVC liners for it is cheaper and much easier to work with. We don't provide PVC, because there is known proof that PVC is harmful. See article. Many landscapers and even organic farmers use PVC extensively in their irrigation systems. We have been confronted by many, stating they want to make more money and the risks are minimum. They point out that Disneyland uses PVC in their experimental farming exhibits in Epcot Center. We point out, Disneyland can use PVC, for they once even sold cigarettes- Walt Disney died of lung cancer. Yes, Mickey Mouse's creator smoked cigarettes and he denied they were a health issue. Some people / organizations never learn. The other manufacturers want the planter boxes to decompose. They want you to buy another planter box from them in every couple of years. Many people do this... They buy the cheaper planter box, the cheaper car, the clothes, etc. These people don't mind throwing away, burning, or rebuilding their planter boxes every two or three years. Is the liner solid? If so, how is the water released? Each box has two to four plumbed 1" drains drilled and sealed into the liner. The drains are countersunk and securely mounted with a large threaded nut. The bottom of each spout has a ribbed collar where a tube or pipe can be firmly attached to allow water to directed to a dish, another planter, to a side yard or to a drain. How long does the RollingPlanter liner last? Our oldest planter we have made are now 16 years old. The liners show little to no wear. The liner used then was 12 mil thick. The current liner is 20 mil thick. One does have to watch how they use a shovel, spade, rake and other sharp tool. If the liner has been punctured it needs to be mended. Call us for patching material and instalation directions. The RollingPlanter liner are super tough!!! What kind of surfaces can the RollingPlanter be placed on otherthan concrete, brick, asphalt? 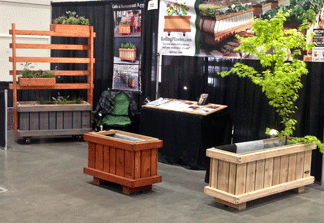 Thenon-mobile raised bed units can be placed on any surface: concrete, brick, asphalt, soil, sand, etc. Once the unit is situated and soil has been placed within, it is not as easy to move as is the mobile version. It will not sink in the soft soil due to it is built on a solid sled base with large plastic pads. The pad base system has enough clearance that a standard furniture dolly or two can be slipped under it for later manageable mobility. 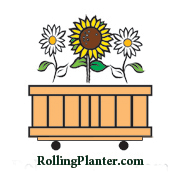 What is the estimate life span for a RollingPlanter? By using the best natural and man developed materials, we anticipate one to obtain many years of use from our Raised Bed Planters. The side walls are made of Western Cedar. Cedar has natural tannins that provide protection from insects, mold, and rot causing fungus. Because cedar and redwood are not known for their structural strength as fir lumber, fir is used for all structural frames and chassis.